The Meddbase RIS PACS platform is an integrated Medical Imaging Software Suite that has been specifically designed around the unique requirements and work flows of Radiology Clinics and Imaging Centres wishing to run RIS PACS software, and the viewing and managing of their DICOM images. Meddbase takes into consideration the complexities around the workflow as the patient moves from reception to the radiographer, to radiologist, and as radiology results are delivered back from the imaging centre to the referring specialists or GP. All parts of this process and work flow are tracked within Meddbase giving a complete overview to the clinic at any part of the journey. This process of tracking the workflow stages electronically also offers better accuracy which is required when dealing with the relatively high number of staff that are engaged in a typical patient encounter. Many other solutions would require three separate software applications to archive this process and run the image centre. These would include a patient and business management application, a RIS (Radiology information system) and a PACS (Picture Archiving and Communications System). Furthermore this requires you to manage separate applications and implement bespoke workflows around them in order to cover any disjointed parts of the process. 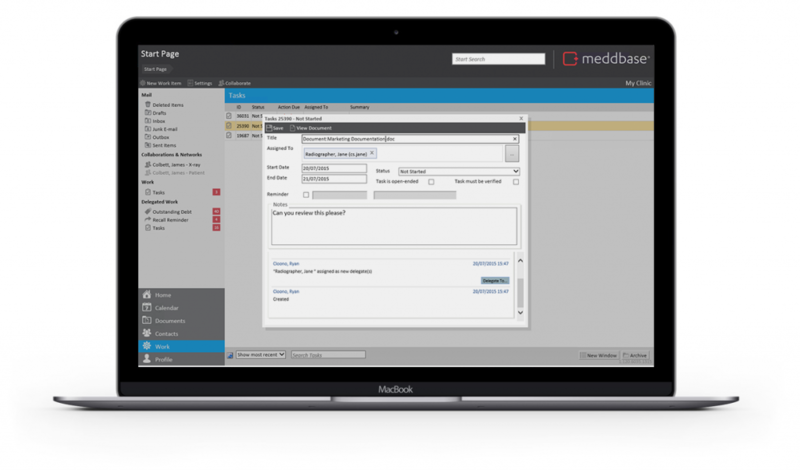 Meddbase believes the process should be covered by one seamlessly integrated software solution which offers you one place to access and manage all parts of your business, data and work flow capture which ultimately allows you to offers better patient care and business productivity.